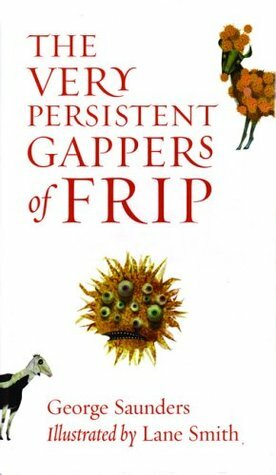 The Very Persistent Gappers of Frip is a fable written by George Saunders and illustrated by Lane Smith. It's a story about the tiny village of Frip—consisting of three families and a bunch of goats—which is infested with gappers: tiny, orange, goat-loving puffballs. Every night the gappers crawl out of the sea and terrorize Frip's goats with their screams of affection, and every morning the children of Frip spend hours picking them off and tossing them back into the ocean. But when the gappers start targeting a girl named Capable's goats in particular, her neighbors decide that she must have done something to deserve such terrible luck. Look, I understand the description above sounds a little weird, and Lane Smith's artwork does an excellent job of reinforcing that. But this is a story with an important and rarely-delivered message: luck is luck. Bad things can happen to good people, and vice-versa. It does no good to judge; all we can do is try to help when other people are having a tough time. That's a pretty solid moral, and one that many of us—not just kids—could benefit from hearing.